(Edited from The Washington Post) During a Q&A session with executive producers of the CW's four black-cast Sunday sitcoms, talk got heated when it turned to the lack of black-cast dramas. "I may stand alone but I kind of feel like that notion in and of itself is kind of unnecessary," said Ali LeRoi, exec producer of "Everybody Hates Chris." "Shows like 'Grey's [Anatomy]' are the model. 'The Wire' is the model. J.J. Abrams has done a fantastic job of involving ethnic people in his shows. You don't need a black drama, you just need a drama that's realistic and involves people in the world. One reporter said it sounded as if LeRoi and the others were resigned to the fact you can't get a black-cast drama on the air. 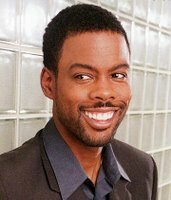 "Well, you are black, I think," Chris Rock, above left, the other exec producer of "Chris," said to the reporter. "Do you ever think your life is going to be as good as white people's? I don't. Have you given that one up yet?" "It's not a resignation. It's a business," "You know, if you don't like dealing with network executives, then write a book. Nobody has the right to be in show business. Nobody has the right to be on a TV show. We all argue about 'I'd like to see more representation about this and more representation about that.' But at the end of the day, dude, you got to sell some soap. . . . So, black drama, smack drama, man, I don't care. It's about making a good show for the audience that's buying the product. Find your audience and sell them what you can sell them." Excerpts from Washington Post "Putting the Chartreuse in CW"